Scary scene in DC this morning. So far, I can't tell if this all happened inside the compound or outside. This is a few blocks from the Washington Nationals Ballpark in a very up-and-coming area of the city. I guess Bryce Harper wasn't too happy about his 0 for 4. Police say 10 people have been shot, including eight civilians and two police officers. A D.C. police officer was shot two times in the leg; a base officer was also shot. Police say the shooter is pinned down between the third and fourth floors of a building on the base. This hits home. I used to work at the WNY, supporting NAVSEA, and still visit the Yard now and then. Know a number of people who work at NAVSEA. From what I heard -- it happened in Bldg 197 (NAVSEA HQ), 4th floor, inside the WNY. 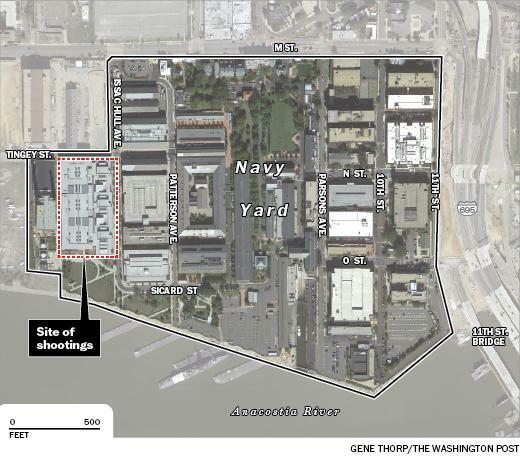 AP: Defense official: Navy Yard shooter "contained" but not in custody. Apparently more than one shooter. 4 killed, 8 wounded, 2+ shooters. And as usual, the comments areas on these news sites are more heated than the actual event. Apparently more than one shooter. Wonder if this will actually be the case this time. It seems like every recent shooting the early reports have said there are multiples when it turns out it was just one. They're saying that there are two victims at two different hospitals that were shot with two different types of ammo. Which could mean one shooter had more than one gun or it could mean that there are more than one shooter. Nothing like a Nissan commercial before breaking news on a mass shooting. Unfortunately, I'm relying on the News Media, so yes, this could very well be the case. First shots happened around 8:20 am. Almost three hours later, I'd have to think this must be a hostage situation now. For those who may wonder how one can get guns on a Naval base, if you have a DoD CAC, there's no security check to get on the base. As for the actual NAVSEA building (197), if you have a NAVSEA badge, you don't have to go through a metal detector (only visitors go through that). A Russian official blasted “American exceptionalism” in a tweet Monday morning, saying the deadly shooting at Washington’s Navy Yard confirms the worst about the U.S.
“A new shootout at Navy headquarters in Washington — a lone gunman and 7 corpses. Nobody’s even surprised anymore,” tweeted Alexey Pushkov, a member of the Russian parliamentary foreign affairs committee. “A clear confirmation of American exceptionalism,” he added. The lamestream media, the drive-by media, or the liberal-biased media? AP is reporting at least 6 dead. Reports of a shooting at nearby Bolling AFB were wrong. Not me. The CIA broadcasts that are beamed directly into my head are coming through loud and clear. Perhaps you need to refold your tinfoil hat? Meh, ideologically biased or not, News coverage in our country has gotten atrocious. That's all the same media! Starting to sound like there's just one gunman, who's dead. Reportedly shooting at selected people in the cafeteria. The Police Chief says "potentially 2 other shooters." I ate lunch in that cafeteria pretty much every day in 2006-07.